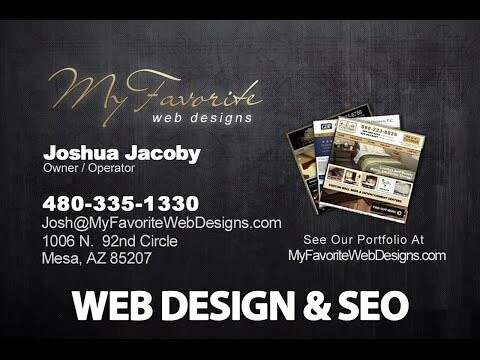 My Favorite Web Designs is a website design & Search Engine marketing company in Mesa Arizona. We deliver beautiful, search friendly websites that our clients are able to easily edit from any computer, tablet or phone. Even if you do not want to edit your own website, when we do editing & SEO using WordPress, we typically cut the time spent in half! We do most of our design work as WordPress Custom Themes, simply because it is a great system. We can program and develop websites in almost any web language and on any platform, and are really an amazing value for small business web designs and brand development, providing everything in house, here in Mesa Arizona. SEO is the technology of getting your website ranked well on Google. It includes things like social media management, local search optimization, photos, videos, content on your website, optimizing your site’s code for Google, all part of our SEO program. We are strictly Google compliant, no automation, and no outsourcing, all SEO is done in house. Our website use responsive design, and can adapt to any sized viewport. Hannah is the senior designer for My Favorite Web Designs. She has designed dozens of websites, for corporations large and small. From innovative icon design to graceful use of jquery to animate elements of the user interface, Hannah is one of the most tasteful designers in the business. Over 10 years of Web Design & SEO, Josh is the owner and senior developer at My Favorite Web Designs. Josh is experienced with HTML, CSS, PHP, JS. Josh has also pioneered many of the marketing programs at My Favorite Web Designs based on his ongoing research into website design and SEO. Alexandra has shown a natural eye for design. As a millennial user, she help provide good insight into a new generation of web users. Currently, Alexandra is focused on landing page design and blog remodeling for existing websites, which is one of the biggest areas which we find clients needing help. I like to take a long view on SEO, since it is an organic process, and we have the best results building a web presence with a full view of marketing and branding in mind. This means starting with an AZ web design built to convert your demographic, and getting photos and videos so we can build great content on that site. Then we set up and engage your social media, and integrate your site, sharing all the great design and optimized content. At this point, we list clients in their niche, on the sites where there clients are most likely to be looking for them aside from Google or social media. We also engage in Local SEO heavily, as map listings are also key to driving qualified traffic for our clients, and at the end of the day that is what az web design and SEO is all about. Websites need to be built for Search engines. Images should be appropriately named, SEO plugins installed so that the basic meta description and title tags are showing. From Arizona Web Designers who overlook the importance of using link structure to create urls that communicate to search engines, to web developers who do not avail themselves of the latest schema.org markup in optimizing their website platforms, the need for the cross discipline of website designer and developer to search optimization expert has never been greater. Make sure your Web Design company is allowing for the proper implementation of SEO in their design! We do web design and web marketing for clients nationwide, but there are clients who prefer to use us as they can have in person design meetings, come by and train on SEO or see what me and my team are doing specifically, and many more advantages derived from a local seo company. We serve clients with SEO and web design in Scottsdale, website design in Gilbert, SEO, web development and design in Phoenix and many other cities. In fact, we have SEO employees who live in Queen Creek and San Tan Valley and commute to our Web Design office in Mesa AZ. Additionally, I went to college in Tempe Arizona, and have many design and clients for SEO in Tempe and Chandler area.